Astronomers from the Harvard-Smithsonian Center for Astrophysics studying the birth of solar systems have found thirteen stars with detectable disks, none of which is as massive as the early Solar system’s disk. Astronomers estimate that at the time the Solar system formed, its proto-planetary disk contained the equivalent of about twenty Jupiter-masses of gas and dust. 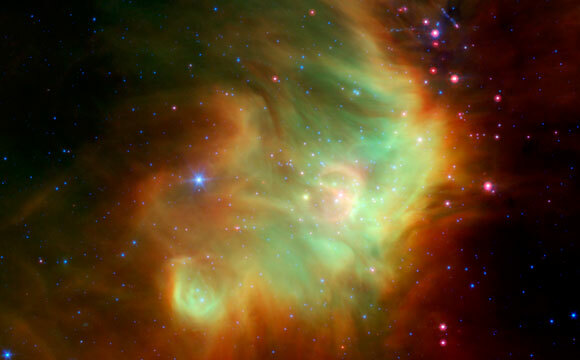 This so-called “minimum mass solar nebula (MMSN)” is derived from the current masses of the rocky planets and calculations of how they formed; a minimum mass is used in case the planet formation mechanism is somehow less efficient than expected. (Some earlier estimates had MMSN values up to about 100 Jupiter-masses.) As a nebula ages and its planets develop, its disk mass naturally decreases; current models estimate that a planetary system can form in under five million years. CfA astronomer Sean Andrews and his colleagues have been studying the early stages of planet-forming nebulae around other stars using the fact that such disks are cool and emit radiation primarily in the infrared and submillimeter regimes. 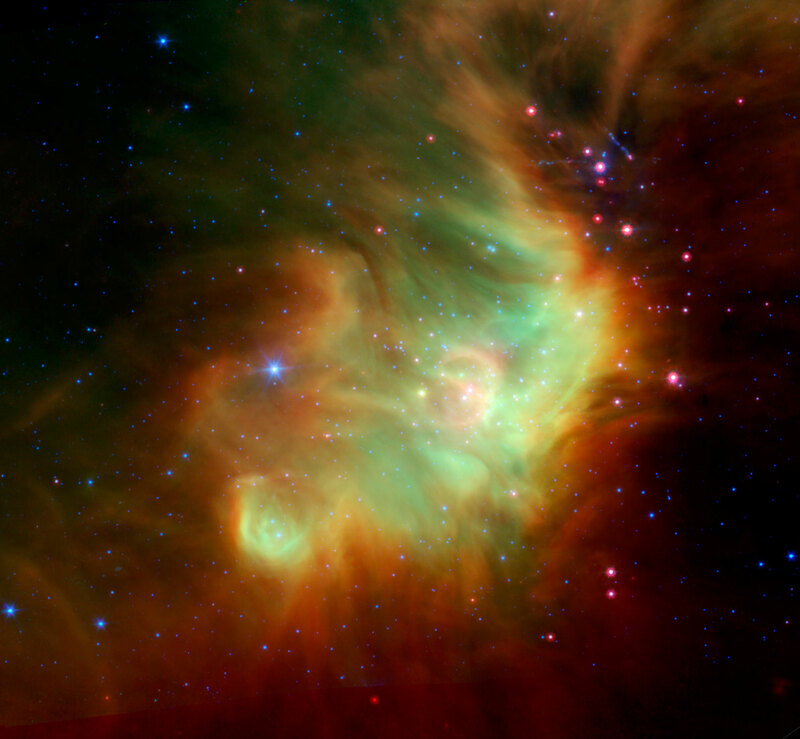 The team used the submillimeter camera on the James Clerk Maxwell Telescope in Hawaii to map the emitting dust in a cluster of young stars known as IC348 located in the Perseus molecular cloud about a thousand light-years away from us. The cluster is estimated to be about two to three million years old, and its planetary systems should therefore be partially developed. The scientists found thirteen submillimeter point sources in the cloud indicative of disks, in a total population of about three hundred and seventy known objects. From its emitted luminosity the scientists can estimate the mass of a disk, and they find these disks range in size between 1.5 and 16 Jupiter-masses — smaller than a MMSN. Their results imply that disks as massive as the early solar system’s are, at least by this age, very rare. Furthermore, expecting that the undetected sources all have smaller and fainter disks, the team combined the observations of all the sources to estimate what the average disk mass was: one-half a Jupiter-mass. The astronomers conclude that fewer than about 1% of stars have a MMSN disk. If most disks start off with the solar minimum mass value, therefore, they must have evolved very rapidly in order to have depleted most of the mass after a few millions years. 3 Comments on "Astronomers Conclude That Fewer Than 1% of Stars Have a MMSN Disk"
Another explanation is that our system was the result of a red giant star with several gaseous bodies in orbit. Through a massive magnetic field compression, the red giant imploded to Sol, our star, and the rocky body planets we have inside the gaseous planets. That makes the gaseous outer planets much older than our inner planets. The asteroid belt is an exploded planet, the material being added to the belts of Saturn and Jupiter and straying farther. The James Webb telescope should provide much new information. Based upon the observations so far made of exoplanetary systems, it is clear that our Solar System is far from being typical. It therefore seems very strange to me that astronomers and cosmologists are so loath to discard the core accretion theory of planetary formation and persist in evaluating their observations through the blinkers of this accepted dogma. That is, because this theory appears to work for our own Solar System (about which I have serious doubts, because simulations rely on high-energy collisions, which cannot happen in a so-called “protoplanetary” disk consisting of particles all rotating in the same direction like a fairground carousel, and on specific starting conditions for the distribution of gases and other elements throughout the disk), they assume that all other planetary systems were created the same way. In any case, arguing from the particular (our Solar System) to the general (all planetary systems) has always been recognized as an ‘iffy’ proposition; and in my opinion “the evidence on the ground” – the widely varying characteristics of exoplanet systems: few planets, hot Jupiters, retrograde orbits, orbital planes at various angles etc. – is much more in favor of creation of these systems by the capture of ‘rogue’ or ‘free’ planets which together with asteroids are the shrapnel from supernova explosions. To be sure, it may be expected that any new-born star would have a ‘dust’ disk associated with it; but that such disks are apparently usually “too thin to form planets” is no surprise to me. Our own Sun, too, may have had such a thin disk, which has been swept clean – apart from the Asteroid Belt – by its motley crew of captured planets acting as “gravity vacuum cleaners”. It may well have been that process which is known on Earth as the Late Heavy Bombardment. The current “Standard Model” of the formation of our solar system is clearly incorrect. In fact, a separate model for each planet would be required using this model. A more coherent and logical model is offered by the EU theorist Wal Thornhill. His model has the added advantage of being supported by the latest data such as described in this article. It is past time to consider the obvious validity of the EU models as the standard models seem to be invalidated on a daily basis with the newest radio telescope data.